Danny and I are both pretty particular about the meat we eat. After being a vegetarian for more than 10 years, I decided to listen to my own body and eat meat again. However, I vowed to eat meat that was created from animals raised consciously, preferably from animals I know. After cooking in some restaurants where meat was chosen by the cheapest price and not for its grass-fed origins or high quality, Danny now wants to eat meat that tastes as good as it can. Right now, most of our meat comes from the pig raised by our landlord on his farm, which Danny butchered himself. Our freezer is full of different cuts of pork and most of the fat we use for cooking comes from the lard Danny rendered himself. But when we have a kid who likes sandwiches, and we are on the road often, we like having packaged luncheon meats, prosciutto, and hot dogs on hand that we know we can trust and we like to eat. This is why we’d like to introduce Applegate as our latest sponsor. We’ve had Applegate in our home for years. Their grass-fed, organic beef hot dogs are the only ones we buy for our daughter. Their bacon graces our table when we have run out of our own smoked belly. And their Italian cured meats, such as prosciutto and coppa, are always available at our grocery store. We’re so lucky that such good meat is widely available. Many of Applegate’s products, including their sausages and deli meats, are organic. Most of their products are free from any genetically modified ingredients, and they have vowed to find non-GMO sources for the few remaining ingredients they use that are genetically modified by the end of 2013. And Applegate is gluten-free. We trust them. I have always felt healthy after eating Applegate foods. This is why we’d like to recommend Applegate to you. And we’d like to let Chris Ely, co-founder of Applegate, tell you more about his company and the work they do. What compels Applegate to make the food it does, the way it does? Were committed to Changing the Meat We Eat by raising animals humanely, without any antibiotics, growth hormones or any other drugs. Its important to us to provide the best treatment and environment for animals because that ultimately impacts the farmers, the planet and the people who eat our products. We have always strived to produce healthier meat products – from how the animal is raised to how the meat is prepared. Doing things right from the start allows us to avoid artificial flavors, preservatives or fillers and rely on the natural flavors of the meat, along with fresh herbs and spices. Furthermore, this means that our products tend to be lower in fat, salt and sugar than their conventional counterparts. Why did Applegate work to make sure these foods are gluten-free? And since all of our deli products have never contained any binders or fillers, we are able to avoid adding the gluten that can be found in other brands. Given that most of our meats are already free of allergens, becoming a go-to source for gluten free foods was a natural progression for us. For instance, we made sure that gluten free alternatives were developed alongside our other breaded items, such as our chicken nuggets, so people have a choice. We make sure all of our plants that produce gluten free products have a program in place to prevent cross contamination. Can you tell us about your sources for ingredients? We work with a network of more than 1,000 family farms across America to source our meat. We have a team of staff that works with the farms to ensure all the animals are being raised to our standards. For our gluten free sourcing, we work closely with companies that specialize in ingredients that are gluten free. Besides being gluten-free, your food is GMO free and organic. Why is that? Were proud to make GMO-free products because the organic agriculture system provides many benefits to animals and the environment. Our Organic line is completely GMO-free, and most of the items in our Natural line are free of GMO ingredients. We recently committed to removing all the GMO ingredients from the remaining 3 products by early next year. For more information on Applegates position on GMOs, check out our FAQ page here. Can you tell us some stories about what your customers say about your food? We get hundreds of wonderful notes from customers and fans each month. Here is a particularly heart-warming one from a mother looking for gluten free foods (edited slightly for privacy). I wanted to drop you a quick note to thank you for what you do! Your products have made a huge difference in both mine and my sons life. My son was diagnosed at birth with Down s syndrome. After years of seeing different doctors and almost losing him to illness several times, he was finally diagnosed as gluten intolerant. It has been difficult, following a gluten-free diet to get enough calories into him so he could build his resistance to infection, but then I recently discovered your products! You have been a literal godsend, providing a variety in diet Id never been able to give him before. He loves all of your gluten-free products and they make it so much easier for me to prepare his meals! Hearing stories like this, and knowing we provide a much-needed meal solution for families across the country makes us proud of what we do each day. Applegate is giving away an ultimate lunch kit away to three readers of Gluten-Free Girl and the Chef. Each kit includes beef and pork bologna (we love this one), turkey breast, slow-cooked ham, genoa salami, provolone cheese, cheddar cheese, and Sunday bacon. To enter the giveaway, leave a comment here about why you are interested in Applegate products. Three winners will be chosen at random on Friday, November 22nd. I always want to buy this brand at the store but it’s a bit pricey for our budget. I’d love to try some products and prove to my husband that it’s worth the cost. I’m not a huge “lunch meat” person but the boys in my family love it and I’d love for them to have a better option. We LOVE Applegate products, especially because of the quality and emphasis on animal welfare! Unfortunately we do need meat. But we can make the right decision to where it comes from and how it’s treated. I’m interested because I can’t eat gluten (Celiacs) and I’m always looking for new things to try that is quick and easy. Salads get old after a while and sometimes I crave a good sandwich/wrap with good quality meat. This sounds perfect. I have had their sausage before and loved it so would love to try more of their products. I usually eat leftovers for lunch…but this would be NICE to try for those times I need something quick. I KNOW my hubby would love it, he LOVES to take lunch meat and make rollups for snacks all the time. Applegate was one of the first companies I found when I was diagnosed with celiac 4 years ago. Knowing a company is so committed to excellence gives comfort to those with celiac and food allergies alike. Thank you Applegate!! I am always pleased when I have the choice of apple gate products. It would be great to sample a variety. I love Applegate because I can pronounce all of their ingredients! Thanks for the fun giveaway. I’m a huge fan of Applegate smoked turkey to add some protein to my salads as it’s casein and gluten free. I would love to try all the other Applegate products and find some more options to spice up my lunchbox!!! Have bought Applegate meats several times – the flavor is so much better, it’s something I always enjoy indulging in. Particularly over toast with a fried egg on top. I love Applegate sausages – the chicken and apple dinner sausages are my favorite! Excited to try the deli meats! I am trying to get my health back by cutting out gluten and eating organic. I am looking forward to trying your products. Thank you so much! I love Applegate products. They are the only packaged meats and cheeses that I will buy for my family. My daughter has Sensory Processing Disorder and ADHD, recently we changed our diet to gluten and casien free to help manage her symptoms without medication. As a family we also do our best to eat all natural and dye/additive free. We also recently found out my fiancée is gluten and dairy intolerant. Since we have to send her lunch to school every day it seriously makes my life so much easier knowing I can send her honey turkey and she will eat plenty of protein at lunch. Also the chicken nuggets and corn dogs make it so nice to have a quick easy meal I can make with a side of raw veggies after a long day of work and school for us. A quick meal I know I can trust for our strict diet. Thank you for all you do!!! I have tried and failed multiple times to be vegetarian. I need chicken; I am a mean, terrible person without it. I want salami; I am not so mean without it, but I sure am happier with it in my life! The reason I want to be vegetarian is because I don’t want the animals I eat to be pinned in some little cage, force fed antibiotics and goodness knows what else. I love Applegate for their commitment to avoiding these things, and don’t feel bad about eating meat when I eat their products. (Plus, I want them to be around to make their gf chicken nuggets for the rest of my life. Those things are amazing.) I’d love to try some of their other products – I had no idea they made bologna! Mmmm. We love Applegate farms lunch meats! Haven’t tried a few of them; we’d love to get to sample new ones. Wonderful product that can be hard to find in my town! I think others know how great it is. Thanks for giving us a great option and great variety! I love Applegate bacon but haven’t tried their lunch meats. I love Applegate! Only brand we buy. My kids love lunch meat so this would be great for their lunch boxes & convenient for me!! This would be great for the days when we’re short of leftovers for lunch! I’ve recently discovered Applegate products and love them! We have been trying to eat meats without nitrates but it can be hard to find. Was excited to see that my SuperTarget had them in the deli section! Love them and buy them when I have a bit extra in the budget. Delish and clean! Love Applegate! Really appreciate the fresh flavor and the variety available. Turkey, ham, and bacon…buy them every week! Applegate bacon is the BEST!!! I love Applegate Farms products. I am trying my best to feed my 4 growing boys uncured meats & Applegate is my “go-to” cold cuts & bacon when I can find them! I have never tried Applegate products. Would love to win and give them a try. Thank you for a great giveaway. Man, I would love to have these in our grocery store! I LOVE Applegate products! As someone who has a LOT of food restrictions, it makes me so happy to know that I can just ask for Applegate meats and then I’ll be safe. So happy you have them as a new sponsor! I love Applegate <3 I buy it at our local store, Oliver's in Santa Rosa. Good stuff! Yum! I love Applegate products! I love Applegate because it tastes like real food. Shouldn’t be so rare in food, but it is! I would love to try Applegate products because I am trying to eat foods that are from reliable sources and are non-GMO. These sound amazing! We love Applegate! We always have Applegate bacon on hand, and enjoy the variety of salami and lunch meats on occasion. I love applegate farms!! GF and great tasting!!! I am interested because I LOVE Applegate products! I buy lunch meat for my husband’s lunch sandwich.I will only buy organic or no hormone meat. He favors smoked turkey. I wish however it was lower sodium, much healthier. When I have a few pieces for a snack, I am drinking water to excess all evening. I love that all their products are gluten free! I love Applegate because it is gluten and nitrate, nitrite free. Nitrates and nitrites affect your thyroid. Since adopting a paleo lifestyle over a year ago, this is the only lunch meat I buy for my nine year old! Applegate products are wonderful! My grocery store only offers Applegate and the processed generic brand, so it’s never a tough choice. Applegate is a great product! We had been purchasing Applegate products at Whole Foods, and I was delighted to know I could still have these when I switched my diet. At home, I try to keep the cooking focus on healthy meats, an abundance of veggies, and fruits and nuts. The Applegate smoked turkey breast is excellent. I appreciate the simple quality of this product. I would love to branch out and try some of their other offerings. Thanks for giving us more information on the company. I pack three lunches a day (I should pack my own while I am at it.) We do not eat much lunch meat because I haven’t found any I really like. I really do love the quality of Applegate products. I buy hotdogs, ham, sausage, bacon, GF chicken tenders and GF corn dogs. thanks! I love applegate products! I have a very picky 3 year old who eats their meats and hot dogs. I am happy to see that they are grass fed, organic, and gluten free! We have had Applegate products in our home for years. I’ve depended on Applegate since my daughter was diagnosed with celiac disease. It’s so nice to know that there’s one brand that I don’t have to worry about making her sick. As a nutritionist, I only choose meats that are humanely processed and not full of antibiotics or other chemicals- and that is so hard to find. As a celiac, what I put in my mouth can either be healthful or poison. I trust Applegate products to have the high quality standards by body demands and my training dictates! If I can’t make it myself, I turn to Applegate. Can’t wait to try other products made from them, as thus far, I’ve only tried the bacon. Keep up the good work Applegate! I love applegate bacon and turkey but I’ve never seen the prosciutto. I’d love to try it. I love the simplicity and ease that comes along with eating deli meats. However, I don’t love all of the additional things that come along with average meats. I’ve been trying to find a brand that I can trust and enjoy eating – and I think I have! Thanks so much for sharing Applegate! I’d like to try their brand. My little nephew has multiple allergies and for years refused to eat all but a few foods, including Applegate turkey. Thank goodness for Applegate! I’m interested in Applegate because I’ve had Hormel Natural Choice lunch meats, and they are slimy and make me gag. I’d like something that’s tastier and more natural for mine and my husband’s lunches at school. I’d love a chance to try this brand. We’re not big meat eaters, but my youngest son has a classmate with a peanut allergy, so we’ve had to pack more lunchmeat sandwiches. Not a problem, but we’re definitely in a rut. Thanks for this, I’ll have to keep an eye out at the store. We try to buy our meat from the farmers directly but sometimes we have a craving that doesn’t match what is available currently. Last Saturday I was most disappointed that the chicken and pig farmer was out of bacon. It would be nice to have a brand available at the local market that we could try and know we were really getting a good quality and not CAFO meat just fed a little better. I love Applegate. I love how it is gluten-free and has a short list of ingredients, with no mystery ingredients. Thank you for this information. I will try to find out where the nearest place that sells these products is located. I love that the pork products are nitrate free, that I can find some of them at BJs, and that the brand is general is reliably gluten-free. Haven’t seen these products before. Would love to try them. I Would love to try Applegate meats. Living in a small town in NE Ohio and coming across gluten free products let alone organic/non GMO is rare. What retailer would likely have Applegate products? Thank you! Applegate used to make a sliced yogurt cheese that was delicious and helpful for those with trouble eating dairy. It seems to have disappeared though, at least at Whole Foods. Any chance it will come back? I’ve not seen this brand. I’d love to try it. Maybe I would eat lunchmeat again if I get it from a company like this. I have both celiac disease and type 1 diabetes. It’s very important that I have protein at every meal. I would love to try Applegate products since they’re high protein and gluten free! We could not have asked for a more healthy and safe alternative to some of our favorite meats, sausages, deli meats and bacons! All natural and organic, gluten and casein free bacon….need I say more? Thank you Gluten Free Girl and Applegate Farms! LOVE this brand. Buy double when 2 for 1 since it can get pricy depending on where you find it. Love Applegate. Would love to win some meat. 🙂 Making a soup with their bacon today. Thank you for posting! I would live to try these products. I’m always looking for a healthier way to eat! We love Applegate around here, especially their bacon! I’d love to win some of their products! 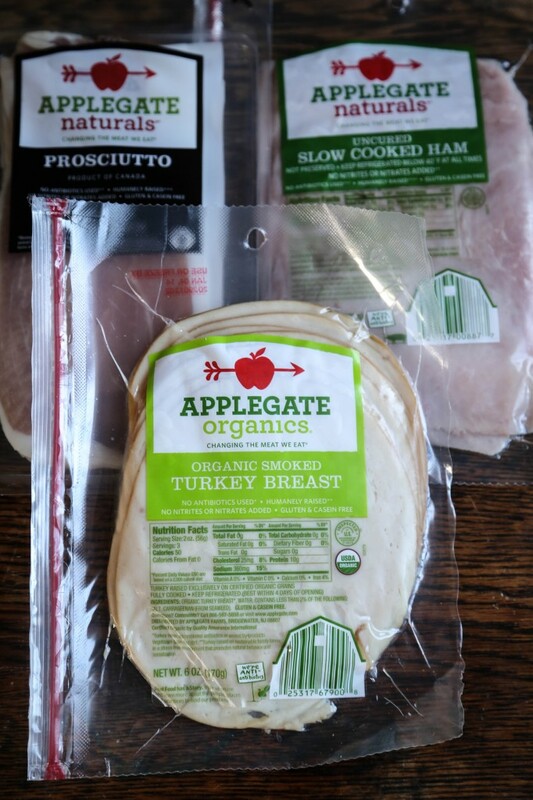 I have loved Applegate meats since my mom started buying them for my little sister’s lunches. Our entire family is gluten intolerant and trying to slowly convert our way of eating to be not only beneficial to our bodies but to other animals and the environment as well. Applegate is one of few brands I trust for high quality deli meat, free of preservatives, and full of great taste. This would be great for my son’s gf lunches. I’m interested in Applegate (and have been eating them sometimes) because they have delicious, delicious products and I feel safe eating them! I haven’t eaten meat for three and a half years and am considering slowly trying a bit of grass fed beef or lamb. This might be another option. Do you know if the beef products are grass fed? Oops, I see that they are! This is important stuff- we fill our lives with too much junk- food wise and other wise…. I love all that Applegate is and stands for! I do wish I could find more of their products near me but I do go on a long drive to buy their hot dogs in the summer! My struggle is finding a way to eat sandwich meat that doesn’t terrify me. So much sodium and so many things I can’t pronounce (and I’m REALLY good at pronouncing things) in the meat at the grocery. I’ve learned so much about finding good food right here on this blog. Love Applegate and glad they are now a sponsor! My son loves their meats for sandwiches. Applegate lunch meat would be delicious in my son’s lunch box! Thanks for doing the giveaway. We love the uncared bacon, salami and ham! The salami is the best if anyone hasn’t tried it. I love Applegate Chicken Hot Dogs. They taste the best – even up against regular hot dogs. I would love to try their other products. They just make sense! My husband has many, many food allergies, and one of the few things he can eat is organic meats. He loves the Applegate products, we buy the following weekly: sliced turkey, turkey bacon, turkey hot dogs. Thank you, Applegate, for producing these healthy products that make my life easier, and his life tastier! I’m much like you, Shauna, in that I typically buy meat from farmer’s that I know — farms I know, animals I know, processing facilities I am familiar with. When I can’t, I buy Applegate. I’ve never tried their bologna, and wouldn’t have thought to do so, until I read this. Would love samples of their products. Thanks for all you do! You guys have really prompted me to consider where my meat is coming from. I’m so thankful for that. I’ve always seen Applegate brand hotdogs at our grocery store. I had no idea how far their product line reaches or everything behind the brand. I love meeting your sponsors and learning about them. Thanks for continuously exposing us to new things and ideas. I really do appreciate you guys so much. This company truly is amazing and one that we LOVE!! I get so excited to go home to UT and stock up at my families stores, Real Foods Market. Yum! If I had to give up chocolate, or applegate sunday bacon… I’d keep the bacon. I’ve tried to love the Applegate products, but at twice the cost of other brands that are also gluten-free and pretty “healthy” (in so far as a preserved meat can be), I rarely buy them. I’m already familiar with, and LOVE Applegate products. But my store doesn’t carry that Bologna – I must try that! I love Applegate products. We used to buy them all the time when my daughter was first diagnosed, unfortunately feeding a family of 4 these high quality foods is a lot more expensive during these tough economic times. We always enjoyed the lunch meats but never tried the cheeses. This lunch kit would be a real treat, especially now that our daughter is in kindergarten and packing her lunch to school everyday! Glad to see you’re a fan of Applegate too! Use their products regularly, would love to win. I have tried Applegate products at several celiac events. Yum, yum. Would love to win this giveaway. Thanks to you and Applegate. I love Applegate and I love that I keep finding new products in my local grocery store. My newest find was the Sunday Morning bacon! Bacon, who doesn’t love bacon? I’ve seen some of their products in local stores, but didn’t realize they have such a variety of products. I could go for a sandwich right now! I recently followed Applegate on twitter and received the kindest direct message after I thanked them there for promoting healthy environments for the animals used in their products. I love Applegate because I can trust that I won’t feel cruddy after eating them. I love the lunch meats the best! We love Applegate products! It’s as important to me what is NOT in their food as what’s in it. Thanks for consistently offering great options that our whole family can enjoy! I saw these products in my supermarket just last week when I was shopping but new nothing about them is I flew right buy. After reading this article I can’t wait to make a trip back to try them. My family loves their bacon! It is to die for. My main two reasons: gluten free (necessary for my daughter) and organic. Most lunchmeats cause me to be suspicious and I avoid them. I’d like to try these though. I think I’ve seen them at my local Target. I’ve never had applegate products before, and the reason I am intrigued the most to try them is – gluten free. I stay away from processed meats because of the gluten they contain and this would be a god send especially for lunches! The Applegate Gluten-Free Chicken Nuggets are a real treat around our house! I always try to have a package in the freezer for a quick meal or snack. I was diagnosed with celiac almost ten yers ago and have strictly followed a GF diet. Lately, my food choices have been less than wise ( although still gluten free). I’d like to try some new products to help me get back on track and inspire some new menus. Applegate has been our choice of lunchmeat as well. But I had no idea they made hot dogs and so many other things. We have only bought turkey, slow cooked ham and turkey bacon. Must explore my grocery store more! I eat only GF and Organic, so I’m happy to learn about Applegate. i love Applegate and i buy their stuff at Sawall’s or the People’s Food Co-Op in Kalamazoo, Michigan. would love to win some, too! I had heard of Applegate Farms in the past, but found their lunchmeat at Trader Joe’s while traveling with my husband for work. I have since found it at our local health food store. Now it is the only lunch meat we buy, and at that, only a few times a month since it is so expensive. It is worth the price, as we all like the flavor and texture so much better than the other natural/no-nitrate lunch meat from the big-box stores, just not doable on a regular basis. One of the “you get what you pay for” scenarios. So, receiving the lunch kit would be a treat! I love Applegate. They were one of the first products I tried after I found out I couldn’t have gluten. Awesome products! I love applegate lunch meats! They are an easy and quick, healthy snack! Love their uncured pepperoni! The very best for GF pizzas! I really like having uncured meats without all the nitrates, nitrites, MSG, etc. Would love to try some of the others that I haven’t seen in my local stores. I’m a former vegetarian too and definitely follow the mantra “less meat, higher quality” for any meat we eat now. I don’t think my daughters will ever be vegetarians – they love their meat! I would love to introduce them to more of the Applegate products. Thanks! I love Applegate farms products! My husband and I can still enjoy a lunch meat sandwich on gluten free bread or make a pizza at home with Applegate’s delicious pepperoni and not feel guilty because of the great quality of their products. I’m interested in Applegate products number one because they have several items that are gluten free. Number two because I appreciate and respect a company that strives to leave out GMOs and to produce a product from animals that are raised in their natural state. I think it says a lot about a company and these are the ones I want to support! I am GF b/c I have fructose malabsorption…wheat is converted to fructose during digestion, so it’s on the “no” list. GF products are very expensive…I’d like to win these products to help offset the cost of my daily diet. I’ve had Applegate products in the past and they are fantastic! Just when I was about to give up on GF, and GMO free meats, I found Applegate Farms. I feel good about serving bacon for brunch again. And woowhoo(! ), the sadswich is back! Just when I was about to give up on GF, and GMO free meats, I found Applegate Farms. I feel good about serving bacon for brunch again. And woowhoo(! ), the sanewich is back! I love applegate products! They are one of the few packaged items I can eat. We mostly eat locally pastured meat, too, but my celiac DH loves sandwiches for work meals. We’ve enjoyed Applegate Farms sausages as treats & I had no idea they had cold cuts. We’d love to try some out! Their chicken and sage breakfast sausage is the best! Just stumbled across your website. my sister has gone gluten free and am studying up on the GF way of eating. And it would not be a bad thing to win something too! yummm i love applegate! there salami is to die for, and at 22 weeks pregnant it allows me to enjoy organic healthy alternatives without nitrates and other gross stuff. awesome! My celiac 10 year old is also dairy and soy free and we eat both the packaged turkey and breakfast sausages. The breakfast sausages make nice little heroes for a special school lunch. I’m really grateful for Applegate meats. I can find them easily in my town and they have such an amazing selection. I, too, was a vegetarian for nearly a decade before I started eating meat again. In our house we still don’t eat huge amounts of it, mostly because our budget it very tight, but when we do it’s go to be meat that we can feel good about and really trust. I had sworn off hot dogs so long ago and tried Applegate’s this summer. What a godsend for summer barbecues! What an amazing sponsor, Shauna! My husband packs a lunch every day for work, also I have 3 little meat-loving grand kids who would love this! I love Applegate meats! Their Sunday bacon is out of this world. I wanted to have a choice to eat meats from producers who treated their animals with care and respect, and Applegate does this. My mom and I are both trying to stay away from gluten plus eat healthy food. We are done with feeling sick after eating all that processed “food”. I’m gonna see if I can’t find this in a store close by. Thanks for informing me! Our family loves Applegate .. I like it because I know it’s gluten free . Good stuff ! Are these products available in Canada? Where? So great to find food that’s real! I have changed my diet drastically since July because of some negative test results and weight issues. Since then, I have an excellent bill of health, have lost almost 30 pounds, and no longer take the prescriptions that were “needed”. I have read the ingredients of more items than I can count and Applegate meats is the hands down winner! Try to find meat that is not only gluten-free, but has no nitrates, corn, soy products or excess sugar and you will not find it outside of the Applegate product line. It costs more, yes, but you know the meat is pure and good and comes from animals who have experienced lIfe the way it was intended for them. Happy livestock makes healthy food. I almost did a happy dance right there in the store when I discovered Applegate. I have added lunchmeat (and bacon) back on my menu thanks to them. we eat applegate’s chicken apple sausage sauteed with chard and a bowl of lentil soup at least twice a month. i love that the sausages are not in a casing and the flavor and quality of the product are consistent and amazing. i also love their packaged sliced turkey and sliced chicken. A+ on flavor!! I have bought Applegate farms when I can find it. Gluten free and good. I also would like lower sodium but as a treat it’s great. When we made the decision to only eat organic, local meat last year, it was a severe strain on our budget, but I have found many ways to use less meat to fill more meals. I would love to win the Applegate products because sometimes it is nice to have someone you trust do the work for you! I love Applegate. They are a stand-by for me, too. When I started eating bacon again, for the first time since childhood, it was from them. Love knowing of a brand I can safely buy when I’m out on the road. I’ll have to see if the shops in SD carry them. I am sandwich crazy but also want to be conscious of eating meat that isn’t full of stuff besides the actual meat and I find Applegate to be well worth the extra price. I’m happy that they’re offered in my local non-chain supermarket, as well, so I can support both enterprises at once. Applegate is one of the few brands that I feel safe eating; I never have to scrutinize their labels for hidden gluten ingredients. Thank you Applegate for offering non GMO products without additives and gluten. Several years ago, I was shocked when I bought a major “high quality ” brand of ham, and discovered it had MSG in it. Now I enjoy your bacon and turkey. It is so nice to buy a product and to be able to enjoy it without worrying about what ingredients it contains. Thank you for sharing about this company. I would really like to try these – we seem to discovering more food sensitivities all the time, and it is nice to have some easy options for my four boys. Now to find if the stores in my area have Applegate! My local Target just started carrying this brand. Maybe that is a good starting point for you. We love Applegate products! Worth the cost certainly, but very tough when the budget is tight! I was just recently introduced to Applegate by a friend. I love the meats I’ve tried and was super excited to see them available at my local grocery store. Keeping my fingers crossed that I win this giveaway! Thanks for the opportunity. I have had the Applegate sausages and could.not.stop. eating them! I bet their lunch meats are just as delicious. I had no idea you were gluten free!! I would love to try them. It’s so hard for me to find things that work with my many allergies (gluten/soy/eggs/dairy/many preservatives) but that my kids will still eat so I’m not making multiple dishes each meal. My girls LOVE the slow-cooked ham! It makes for a school lunch that they both will eat, and that is a rare occurrence, indeed! These products look great – healthy and conscientiously produced. The way food should be! Would love to try them. We love Applegate’s products! Thanks so much for this opportunity! I love that there is a healthy and organic option for when I am on the go. The deli turkey has gotten me through many a lunchtime and for that I am thankful. hope I’m not too oatte for Applegate giveawawy! need better stuff for Hugs! These products are great. Thanks for offering the chance to win. We would love to receive this giveaway as we reside in Southeastern Montana and quality meat products are difficult to find here. I would love to share these products with our local purveyors. I would love to try the varieties I have not yet tasted. Looks yummy! Applegate maple chicken sausage is a staple in our home. I seriously don’t know what I would do if they stopped making this product. I have celiac disease and my whole family, including a teenage boy and a pre-teen boy, are trying to support me by cutting way back on their gluten intake. We try to eat as many natural, , non-processed foods as possible but my boys love deli meat. The Applegate products look like a good fit for our household and I would love to try their products.